For many of our interactions with digital media, we do not sit at a keyboard but hold a mobile device in our hands. We turn and tilt and stroke and tap, and through these physical interactions with an object we make things: images, links, sites, networks. 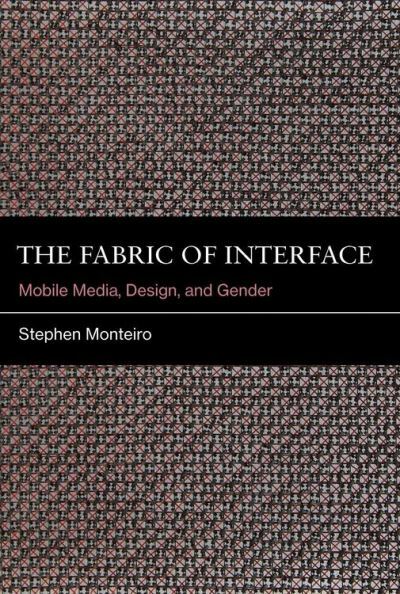 In The Fabric of Interface, Stephen Monteiro argues that our everyday digital practice has taken on traits common to textile and needlecraft culture. Our smart phones and tablets use some of the same skills-manual dexterity, pattern making, and linking-required by the handloom, the needlepoint hoop, and the lap-sized quilting frame. Monteiro goes on to argue that the capacity of textile metaphors to describe computing (weaving code, threaded discussions, zipped files, software patches, switch fabrics) represents deeper connections between digital communication and what has been called "homecraft" or "women's work." Connecting networked media to practices that seem alien to media technologies, Monteiro identifies handicraft and textile techniques in the production of software and hardware, and cites the punched cards that were read by a loom's rods as a primitive form of computer memory; examines textual and visual discourses that position the digital image as a malleable fabric across its production, access, and use; compares the digital labor of liking, linking, and tagging to such earlier forms of collective production as quilting bees and piecework; and describes how the convergence of intimacy and handiwork at the screen interface, combined with needlecraft aesthetics, genders networked culture and activities in unexpected ways. cting networked media to practices that seem alien to media technologies, Monteiro identifies handicraft and textile techniques in the production of software and hardware, and cites the punched cards that were read by a loom's rods as a primitive form of computer memory; examines textual and visual discourses that position the digital image as a malleable fabric across its production, access, and use; compares the digital labor of liking, linking, and tagging to such earlier forms of collective production as quilting bees and piecework; and describes how the convergence of intimacy and handiwork at the screen interface, combined with needlecraft aesthetics, genders networked culture and activities in unexpected ways. THought some here could have a chuckle.